Aim This Event Will Eventually Result in Bringing a Comfortable Life to Citizens in Seki. This year is the fifth time to have this interactive event, “The Factory Visiting Day in Seki”. The number of the participating companies in various genres is increasing every year, and we have 41 companies this year. 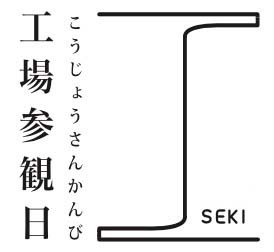 We will promote a “Town of Manufacturing, Seki” to people from inside and outside Seki for four days. A lack of successors is one of the issues we have, however, I wish that more people would have an interest in manufacturing and would desire to work in Seki. Not only the city government but also companies and citizens’ groups work together to support this event. Fun and productive workshops that each company elaborates will raise everyone’s interest and bring new perspectives. And above all, craftsman’s serious attitude towards their work will leave a strong impression. We are in the hope of revitalizing the economy and developing the town where people would want to live and work. Our goal is to discover attractive points in Seki’s industries and building pride in our region. Thus, it will eventually result in bringing a comfortable life to its citizens. In this fifth “The Factory Visiting Day in Seki”, more companies from various business styles participate. Seki is famous for its cutlery industry, but other types of industry also contribute to develop this attractive town. This year, we focus on “diversified ways of working” and aim to connect the surrounding areas of Seki and generations. Please enjoy this midsummer event! This is the fifth “The Factory Visiting Day in Seki”. The number of the participating companies is increasing every year, and we have more variety of business styles. I believe that visitors can enjoy the various types of companies. “The Factory Visiting Day in Seki” has gained publicity gradually, and I have confidence about the growth of this event as a member of the executive committee. The participating companies hope that this event will revitalize the economy and develop the town. Please come and feel the powerful work sites.